Even with East Nashville, Sylvan Park, 12South and its neighbors being devoured by contractors, developers, and builders over the past four years, property owners in Green Hills, Belle Meade, the Belle Meade Highlands, Courts, and Links have felt that their properties are sound investments, as sound as any in the city. As The Gulch began to mature and the parcels continued to be filled with fun, exciting businesses and Nashvillians began to understand the live where you work and play where you live philosophy, some of the Green Hills dwellers began to investigate urban living. When the Viridian opened its doors in 2006, most of the units were filled with younger buyers, but a few older people ventured into Nashville’s first high-rise condominium. Word soon spread among the boomer generation that the developments had groups of neighbors that had established book clubs, and even some dinner club groups emerged. Yes, people actually lived in the building just like they lived in their standalone houses. The only difference being the Viridian is close to everything downtown, and by 2006, downtown was vibrant. Nothing like today, but on its way. After learning of the fun downtown and realizing that prices were lower in the newly developed urban core than in the established neighborhoods, exploration and migration began. One problem is that some have been slow to act. A Viridian unit that sold for $325,000 in 2006 is now $460,000. New construction across Division from The Gulch has price points beginning at $700,000. As you will see in the Sale of the Week, houses near the fairgrounds are $500,000. Homes in the more established areas of town have not appreciated as quickly. There were families with children in college waiting for the tassel to turn with plans of selling in the established areas and pocketing enough to pay cash for a downtown condo with a little left to throw into the retirement account. At this point, the new, urban properties are much more sellable and, thus, more expensive. What the heck. The kid is probably going to grad school anyway. The Wedgewood Houston area is in the midst of a massive redevelopment movement that began a couple of years ago and is in full swing. Known now as WEHO, sometimes WeHo, the properties that comprise the hot spot are located in and around the fairgrounds. Tim Kyne and Victoria Anest have listed numerous properties there and continue to represent several developers who have gambled and won on the flourishing neighborhood. 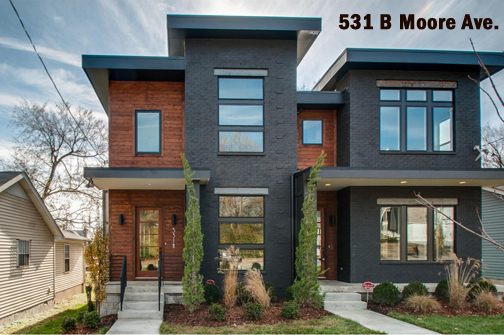 Last week, they sold 531B Moore Avenue, a 2,402-square-foot house with three bedrooms and two and a-half baths for $514,900, a price now considered reasonable for the area. In 2008, a developer building affordable housing units had difficulty getting 1,850 square feet to appraise for $100,000. And the years from 2008 through 2011 participated in the Great Recession. As a result, anything built in 2012 would have been less than 2008. Now properties sell for numbers that no one could have imagined in 2012. Interestingly, the owner who sold the house to the developer paid $46,100 and bought the property from Fannie Mae in 2010. Fannie Mae had foreclosed on a $66,687 loan. In 2015, the owner who had paid $46,100 sold the property for $200,000 to the developer who made two lots from the parcel. The Moore property is attached, once considered the kiss of death, now a who-cares non-issue. In short, the architect covered all the bases in these homes with the exception of location and now with hundreds of these homes replacing 1,200-1,500 1960s non-historic house with zero architectural interest, they have created a desirable location. Then there is the question that Steven Demetre Georgiou raised in one of his songs, and that is “Where do the children play”? Georgiou later changed his name to Cat Stevens, then to Yusuf Islam, then to Cat Stevens, but the question remains. And the answer is that they play in the parks, and in after care, and on sports teams, ballet lessons, chess clubs, the library, TPAC, any and all of the neighborhood festivals that have blossomed all over the city. Nowadays backyards are botanical, landscaping challenges or dog pens. The widely-heralded Peyton Snodgrasss of PARKS represented the buyer in this transaction.